Your home is always under threat from many different things, for example the elements or its own aging structure. That’s why you need to be careful and take steps to make sure that it’s always secure and safe from the threats it faces. It’s best to do this now rather than later before it’s too late. Here’s how to protect your home properly from all the potential threats it faces. Where you live and what the weather threats are at that particular time of the year should always be in your mind when trying to protect your home. If you know that you’re entering a stormy season, you should check your home for problems and ensure it’s ready to withstand the storms. The same applies to whichever weather threats your home faces. Having the right insurance coverage in place is really important for your home. Without home and contents insurance covering you, you will always be taking a big risk if something does cause damage to your home. You might be left with a huge bill and no help from an insurance company, which is not what you want at all. There are so many options on the market so compare them and get covered. Structural damage is something that you will obviously want to avoid because it can be very serious and cause a lot of damage to your home if you’re not careful. You should keep looking for any signs of structural damage. You should check the basement too because problems can first arise here before you spot problems anywhere else. If you spot a minor problem in your home, you should try to deal with it as soon as you can rather than allowing it to get worse and more costly to put right. By putting in this little extra work, you will actually be able to make a huge difference to the future of your home. You won’t regret fixing those minor issues if it prevents them from becoming bigger ones later on. Protecting your home doesn’t have to be a chore. It’s all about taking care of the most basic and important things. That’s what really matters when it comes to looking after your home and making sure that it’ll be safe and durable for as long as you’re living there and beyond. Awesome Costume Award goes to my cousin. As soon as you have children, you will need to start thinking about how you are going to start saving for their future education. As we all know, college is expensive and the cost of tuition is constantly rising, leaving graduates with a mountain of debt. The best thing you can do set up the funds for their future education which you can start doing today. Here, we are going to take you through exactly how you can start saving for your children’s education. Online bank accounts are the best way to start saving for your child’s education in the future. A savings account will allow you to put money away every month and keeping this money completely separate will ensure that you don’t accidentally spend it. Get into the habit of putting money away into this account every month and the earlier you start, the easier it will be to get these important funds together. Open this account shortly after having your child to start the process. To help you get started, have a look at the BB&T online bank accounts as they offer basic checking accounts that are simple to manage as well as an option that boasts many premium benefits. Alongside opening a savings account, there are many other additional ways in which you can start getting the money together for your child’s future education and one of these ways is the 529 college plan. This is similar to a Roth IRA as a 529 college savings plan will allow you, the parents, to invest after-tax money into diversified, low cost stock and bond funds. What’s great about this plan is that you can then withdraw the money tax-free for qualified education expenses. This offers you a massive tax advantage as once you use it to pay for the tuition expenses you won’t ever have to pay taxes on these funds. An alternative to the 529 savings plan is the prepaid tuitions plan. This plan allows parents who know their child will be attending an in-state public university to pay for tuition credits in advance and at a predetermined price. While this is good for the tax benefits and it won’t be subject to swings in the stock market, there are some limitations to this savings plan. For example, if the child does not go to an in-state school, while you will get a return on your money, you won’t get the full benefits of the plan. Finally, the last way in which you can prepare to start saving for your child’s education is to open a Roth IRA in their name once they start to earn an income. Restrictions on this mean that withdrawals will keep investors from taking earnings out penalty free. Like all investments, the earlier you start to save, the more time your money will have to grow. This should give you the motivation that you need to start saving now if you have not already done so, so you can give your child the very best education in later life without having to worry about the financial implications of doing so. Admit it, you don’t think of renovating the dining room that often. In fact, you might use the dining room so little that you don’t even think about it at all other than when running the hoover round or making sure that it’s not full of dust. It’s not the most popular room in the home, which makes it the most forgotten room in the home. But the dining room has so much unspoken potential, we really do think it would be such a shame for you to put it to waste the whole time that you’re living in your home. So, we think we know exactly how you can make sure that you have the most perfect dining room renovation, and what a great dining room actually looks like! Have a read on to find out more. If you rarely use your dining room, then we know it’s going to be outdated and probably not even worth dining in. So, we think you should go back to basics, and strip your dining room of everything in it. From the table and chairs, to the carpet, to the decor on the walls. Everything that’s in it can be replaced so easily, and starting fresh gives you a whole new outlook on the room. Once you’ve got a bare room to work with, you can start to look at how much it’s going to cost to add new things in. We know it won’t be too much, and the price you’ll pay will be more than worth it when you get a whole new fancy dining room to use at your disposal. We will say that we do think you should keep things simplistic and elegant for the dining room, but we’ll discuss more about design ideas later on! Open plan is the best way to go in our opinion when it comes to the dining room. This is a design idea, so it would be up to you to find a style to decorate it with once the renovation is done. An open plan design is best when you knock through to the kitchen. It creates such a space for socialization and family fun. Plus, it will add size to your kitchen. Having it open in terms of windows is also a good idea. It allows natural light to flood in, and gives you a good view to look at while you eat ! You can get custom curtains online as well when you’re looking for that little bit of extra privacy. If you don’t like the idea of making it open plan in terms of big windows as well, then you’re going to have more room to focus on decor. If you want to find a really good style you may want to search online for inspiration. Nothing does it better than looking at professional interior design pages to see what their thoughts and expressions are. You’ll then be able to take bits from each one! Are you planning on doing a bit of home improvement to enhance the appearance of your property? No matter whether you are going down the DIY route or hiring professionals, you need to make sure that you plan the project carefully so that all potential mistakes are avoided. With that being said, read on to discover more about the common home improvement mistakes that people make so that you can avoid making them. Do you have a mistake that lost you time and money? If so please share it in the comments below. There is only one place to begin, and this is with taking on jobs that would be better left to the professionals. This is a mistake that a lot of over-enthusiastic DIYers tend to make. Yes, DIY is a great way to save money. However, you need to recognise that it could cost you much more money in certain cases if you do not do the job correctly. So, when you are determining whether or not to do a home project yourself there are a few things to keep in mind. Tasks like plumbing and electrical work should always be carried out by pros unless you have prior experience. Moreover, a Gas Safe Registered Engineer is a must for any project involving gas. If you are going to make the most of a professional service, it is imperative that you conduct extensive research. You need to opt for a company that has a good website and has received lots of positive feedback from previous clients. You can see a good example of this at http://www.brisbanehousepainters.net/. Companies like this have plenty of trust and quality signals that will put your mind at ease. Simply going for the cheapest or first company you lay your eyes on is a recipe for disaster. If you ask the vast majority of traders to name the biggest mistake that people make, it is likely many of them will go for this one. This is where communication really comes in. It is important to thoroughly understand what the project entails before you agree to proceed. Last but not least, there is nothing more frustrating than finding out your home improvement project is going to be much more expensive than you imagined it to be. However, this can easily happen when you do not budget effectively. Head to http://www.homeimprovementweek.co.uk/how-to-budget-for-a-home-improvement.html for some tips on how to budget effectively. It is always a wise idea to get at least three quotes for every job so that you can compare them properly and get a good idea regarding the average rate. So there you have it: an insight into some of the most common home improvement mistakes that people make. If you follow the advice that has been presented above, you can give yourself the greatest chance of ensuring your home improvement project goes exactly how you envision it. Deciding you would like another baby can be an extremely exciting time for your family. You and your partner may be excited about the prospect of another child. Your other children may be Jumping for joy when expecting another sibling to play with and cuddle, and overall it can be a great thing for your family. But, on the flip side and perhaps more practical side of things, there is always going to be an impact on your financial situation. So while it is inevitable that your bills might rise, how do you spend less? I wanted to share with you some of the ways you could do it. Planning can be your secret weapon. It can be more useful than ever before when it comes to adding to your family as there may be an increase in things like your food shopping or your clothing purchases. Meal planning and writing lists can be a great way to save on that big food shop bill each month, even if you are eventually buying more things. As well as using coupons and vouchers while shopping, which works for other purchases like electrical items and clothes. It may become apparent that you might need to make some big purchases to accommodate the extra member of your family and a car purchase could be on the horizon. So make sure you shop around for the best deal. If you require a loan, use websites like Auto.loan to help you work out monthly budgets and costs. Shopping around for deals can help in other ways to give you reduction on your bills, such as energy providers and insurance policies. The Size of your home can be a deciding factor when it comes to having another baby, so moving might become a possibility. But there is added stress and costs that are involved in that, so instead why not invest in your current home? Adding on create more space as well as converting areas in your home that perhaps are not used to their full potential such as a garage, a loft space or a basement. It could make all the difference and might work out cheaper than moving. Did you save any baby items from previous children? Now is the time to unpack it. This can help you figure out what you need to buy for the new baby. Just saving items from your older child can end up saving you a lot of money. Finally, you may find that you do need to make some purchases when it comes to your new addition, so try and be a little more frugal with it. Ebay is a great place for unwanted items that are still in good condition. People pick up second hand strollers all of the time. Local Facebook selling pages often have great deals, as well as yard sales and your local second hand shop. I hope that this helps you to spend less when adding to your family. Permeating your home with love is a wonderful thing to do. It helps the home atmosphere feel connected, and helps your children develop childhoods they remember fondly for the rest of their lives. What is the point of having a family in the first place if love is not your first priority? However, in the struggles of life, sometimes it can be quite hard for people to see eye to eye. We’ve all have small fights with our family from time to time, to do so is mostly natural. However, it’s important to understand that a solid bedrock of loving feelings in a household can help that household shine, and should help the golden years continue throughout its history. Families that have fun games together are usually those that enjoy time together. To start this you need to be present with one another. It might be a good idea to start Halloween games, to design an Easter trail for your children, or to simply relax in the garden playing baseball with your children. However, games may not be the only method of having fun with your family. Peaceful activities can share the same purpose. It might be heading on regular bike rides with your loved ones, or having them help you with the garden atmosphere. The only way for a family to correctly develop a real love for one another is to actually spend time doing things together, the content of which may not matter over the initial requirement of simply ensuring it happens. A home without decoration can feel empty, drab and boring. In order to prevent your home from feeling this way, be sure to invest some of your budget into decorating. To increase this working budget, consider improving credit score competence, and perhaps purchase some items on finance. Family photographs, custom artwork, and custom picked items from the furnishings store can all help you create themed rooms that the whole family can be proud of. A little love and care goes a long way when developing the character of your home, and this can be plain to see. The best places to decorate are your children’s bedrooms of course, but also feel free in indulging yourself from time to time. A home you are proud of is a home you love to be in, and with that the atmosphere of your home changes. We know how busy life can be. It seems like responsibilities can drag you from one location to another, again and back and back and again. This might unfortunately mean you spend much less time at your house than you would like to. However, purposefully scheduling time for all or most of your family members to be in the house at one time can help the natural sense of the home being lived in, and help you contact one another more frequently. After all, a home is more than somewhere you rest at night. With these simple tips, your home is sure to be permeated top to bottom with love. Why You Should Consider Consider Upgrading To The HP Envy x360 Laptop. Though I have been compensated in the form of a Best Buy Gift Card for this post all thoughts and opinions expressed are my own. I have recently been looking at laptops for my grandson. One of the ones we have been checking out is the HP Envy x360 . If you are also looking to upgrade from your current laptop now is the perfect time to check this one out. The reason being that right now Best Buy is offering $100 savings on this 2-in-1 laptop. The deal ends 7/28 so you better act fast. HP Envy x360 laptops are 2-in-1 devices that can transfer from a laptop to a tablet in seconds. The Laptop is available with either a 13 inch or 15 inch screen.These touch-screen laptops come with Windows Ink capabilities and a Windows operating system so you can write on the screen with your stylus. AMD processors make them fast and thin so you can take them with you anywhere you go! I hope you will let me know if you purchase one of these laptops and what your favorite feature is in the comments below. While some gadgets can be gimmicks, other pieces of technology are essential to own in this day and age. If you’re looking to buy some new electronic appliances but only have a small budget to work with, consider some of these tips for helping you to spend less. When something breaks, many of us find it easier to simply replace that item, but there can be times when repairing that item could save you money and be the more sensible option. Collect quotes from repair services and weigh up the costs. It may even be possible to do repairs yourself. There are many online sites where you can buy the parts you need whether you’re looking for wirewound resistors or a new washing machine drum. There are tutorials on sites like Youtube for pretty much any repair job – these could help you to do your own DIY repairs, saving you money on hiring a repair service. You shouldn’t always repair appliances that are broken particularly if they’ve been constantly failing – this could be a sign multiple parts are wearing out. 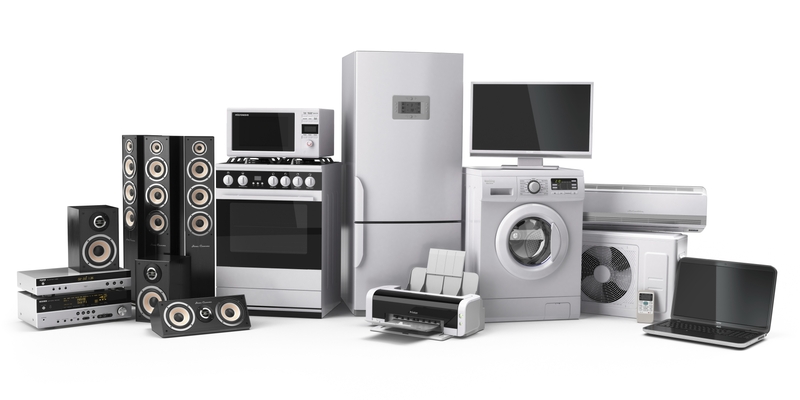 Old appliances may also be worth upgrading in order to save you money on your electricity bills as many newer appliances are much more energy-efficient (anything over 15 years is probably worth replacing for a newer greener model). Electronics stores will often have sales throughout the year, usually when they’re expecting a new line of models in. This could be a great chance to get a discount on a new TV or washing machine or laptop. Big sales such as Black Friday are worth waiting for. There may also be sales around Father’s day on various gadgets. Coupons are another great way of getting discounts. There are plenty of coupon sites where you can get voucher codes to use in stores. Check the expiry date as many of these coupons will only be available to use for a limited time. It’s possible to hire and loan appliances through finance schemes, allowing you to pay for them in small installments over a period of months. There are companies that allow you to do this with everything from laptops to refrigerators. You may end up paying more in the long run overall, which is the only disadvantage – plus it’s easy to less finance bills pile up by buying multiple appliances on finance. You can get many pre-owned electronics for cheap online via the likes of Facebook and Gumtree, however did you know that you can also sometimes get these items for free. Many people are so eager to get rid of their white goods that they’ll offer them for free so long as that person is able to pick up the appliance in person themselves. These are unlikely to be in top condition, however when you consider that you’re getting it for free that doesn’t really matter. Many sellers like to offer extended warranties – this covers you for repairs/replacement if the device breaks. Rarely are these warranties worthwhile, however if you have a bad track record for breaking gadgets such as laptops and phones, you may be able to justify these warranty costs. There comes a time for every home when there needs to be a bit of a refresh. After a few years, the decor options you chose in the past will start to age, and it’s likely that the styles will be a little out of date. Of course, combating this is simple, and all you need to do is look for ways to start renovating. This is where things can get tricky for a lot of people, though. Time is always a factor in life, with most people not having enough of the stuff to start working on large projects. To help you out with this, this post will be exploring the easiest possible route to take when renovating your home. Having furniture and other possessions in your home while it is being painted and decorated will often result in things being ruined. Self-storage companies can help you with this, giving you loads of options when it comes to temporary homes for your items, and a moving company can be used to take everything back and forth. This is quite an extreme step, but it will be worth it to get the job done quickly. It’s unlikely that your walls will still be smooth after a few years, and this can only be fixed by a professional. The type of person you hire for this will depend on the way your home is built. It may be a simple matter of chipping away at the old paint and applying some touch ups. In other cases, though, you could be faced with a bigger challenge, and a professional plasterer can help you in both instances. Along with someone to do the hard work, you may also need to hire a skip company to take away and store the waste. With the walls smoothed out, your place will be ready for the walls to be started on. When you’re painting, it’s important to keep in mind that there may be drips, and flooring should be left until afterwards to avoid new carpet or tiles being ruined. There are loads of companies out there which are dedicated to helping people with these parts of their homes. Depending on who you choose, you may be able to have all of the waste taken away as part of the service, and this will make the whole thing much easier. While you have all of the furniture in storage, you will have a great chance to start looking at new options to add to your renovated space. Companies like Deconovo are perfect for this, providing you with ranges of styles which all go together very nicely. This can save loads of time when it comes to searching for your furniture, as you won’t have to piece together your own collections from different stores. Using Instagram for some Inspiration can also help at this stage. Before you can bring your new furniture into the home, you will need to think about the mess which has been caused by all of the work going on. Of course, though, in the spirit of this post, you don’t have to do any of this, and can leave it to someone else. There are loads of cleaning companies out there which offer single-time services covering all levels of grime. You will pay more or less depending on how bad the place is, so it could be worth trying to save here by doing as much as you can by yourself. This will be the stage of the job will require the most involvement from you. Using the same moving company which took everything away, you can bring everything back and have it moved back in for you. You will need to be there to make sure that your dreams come true, though. While they are professionals, the people helping you won’t know where your items need to go. The job should only take a couple of hours if you’re there to direct everyone and make sure that things are in the the right places. Hopefully, this post will inspire you to start working harder on the time you put into taking the effort out of your home renovations. A lot of people find this sort of work hard, struggling to find the time to sink into their projects. It doesn’t have to be this way, though, as long as you’re willing to get some help.